I love these tweezers! They have a good grip and seem to pull out hairs effortlessly with minimal pain. I owuld definently recommend these tweezers! I receive dozens of emails weekly asking me about which high end products are worth splurging on, and by now you ladies know that I wont rave about a high end product unless I felt like the price is justifiable and worth it. So today I bring you a review of a product that is worth every single penny, it is the Award Winning Tweezerman Slant Tweezers which retail for $22. I've been on the hunt for...read more the perfect tweezers and I believe I have found them, first of all what is the importance of good quality tweezers? Plucking your eyebrows should be an easy and painless process and I've experienced that in the past the tweezers I was using made it very difficult to have a pleasant plucking experience. The Tweezerman Slant Tweezers are amazing for many reasons, the first being that it is sized perfectly not too small and not to gigantic! In addition, the tip of the tweezers are very flat and not too sharp which makes it super easy to pluck out even the smallest and toughest hairs in just moments! I love how these particular tweezers are slanted at the tips which is perfect for tweezing in any angle. Also, they are made of stainless steel which means that they do not easily rust or corrode, and this is why they are 100% worth every penny because you'll never have to replace it! Here's what Tweezerman had to say: " We've all been annoyed by using tweezers that don't properly grip. With superior calibrated tension and perfectly aligned, hand-filed precision tips, Tweezerman tweezers close evenly and firmly, creating the cleanest, most advanced pulling power. 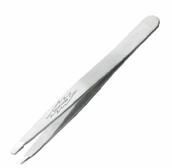 These are the tweezers you'll own your lifetime — and they come with a free sharpening guarantee." I can guarantee that once you use Tweezerman Tweezers you'll never go back to any other, these tweezers make the world of a difference in your brows; I highly recommend it for anyone who is looking for tweezers that actually get the job done and that will last a lifetime! The Tweezerman Slant Tweezers are an investment worth making!! I used to use an inexpensive tweezer because I thought a tweezer is a tweezer. Wrong! Ever since I got this one, I cannot go back to any other tweezer. My old one sometimes did not grip the hair firm enough, and when it does, it snapped the hair off instead of removing it. Tweezerman's Tweezer firmly and precisely grips and never pinch my skin. It was much more expensive than others, but I don't regret this investment.